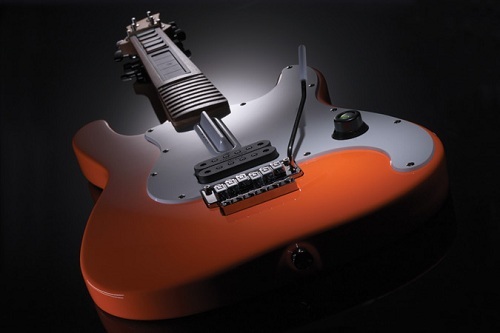 Preview – Logitech's Wireless Guitar Controller For Xbox 360 | OhGizmo! By Chris Scott Barr on 06/19/09 • Leave a comment! Back at E3 I had a chance to chat with the folks over at Logitech. If you’ll remember they were kind enough to let me have some hands-on time with their G940 Flight System. However, the moment I walked in the door they saw me eying a different piece of hardware. It was under embargo, so I haven’t been allowed to talk about it. Well today that has been lifted and I’ve been given the go-ahead to tell you guys about it. It’s no small secret that I’ve been a Guitar Hero nut since the game came out. My close circle of friends know just how picky I am about the controllers I use. (Seriously, I modded an original SG controller from the first game to work with my 360 because I hated the X-plorer so much.) Well let me say right now that I’ve found a new favorite, Logitech’s Wireless Guitar Controller. You might stop me and say “Chris, this is old news, they’ve had one of these out for a little while.” You’d be right, but I don’t play on a PS3, this one is for the 360. 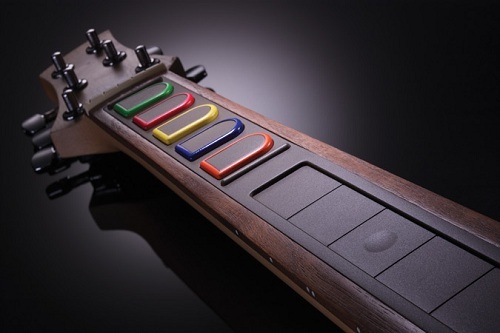 This controller is essentially a real guitar with a solid body and a rosewood fingerboard. Yes, it is smaller than your average guitar, but trust me when I say that this is a good thing. I’ve used the Starpex PS3 guitar which is full-size and it wasn’t nearly as much fun to play. (And yes, I do have a real guitar which is a completely different story.) The weight was about perfect, as was the size. I didn’t have a lot of time to play with it, but during the song I played I found that the buttons were positioned perfectly (an area that other “real” guitar controllers have lacked) and were very responsive. The two greatest features about this controller are the overall look, and the fact that it is an officially licensed wireless controller for the 360. This is something that I would proudly set next to my entertainment center, and would definitely suggest to anyone playing Guitar Hero or Rock Band on their 360. The only downside is that you’ll have to fight your friends to actually get to play with it. The $199 price tag is a bit steep, but if you’re serious about your gaming, it’ll be worth it when it hits stores later this year.